The Honda Fit (Japanese: ホンダ・フィット, Honda Fitto), also marketed as the Honda Jazz (Japanese: ホンダ・ジャズ, Honda Jazu), is a five-door, front-engine, front-wheel drive B-segment subcompact car manufactured and marketed by Honda since 2001 and now in its third generation. Marketed worldwide and manufactured at ten plants in eight countries, sales reached almost 5 million by mid-2013. Sharing Honda's global small-car platform with the City, Airwave, Mobilio, Mobilio Spike, Freed and Freed Spike, the Fit is noted for its one-box or monospace design and its re-configurable interior — with a cargo volume competitive to larger vehicles. Honda released hybrid gasoline-electric versions of the Fit in Japan in October 2010 and in Europe in early 2011. Honda released the Fit EV, a limited production all-electric version, in the United States in July 2012 and in Japan the following month. By 2012, Honda Fit was produced in 12 countries, including Japan, Brazil, China, India and Indonesia. Honda uses the nameplate "Jazz" in Europe, Oceania, the Middle East, Africa and some parts of Asia such as Hong Kong, Macau, Malaysia, Indonesia, the Philippines, Thailand, Singapore; and the name "Fit" in Japan, Sri Lanka, China, Taiwan, and the Americas. The Honda Fit debuted in June 2001 in Japan, winning the Car of the Year Japan Award. By December 2001, it had outsold the Toyota Corolla, and ranked first in sales for nine out of twelve months in 2002. It subsequently was introduced in Europe (early 2002), Australia (late 2002), South America (early 2003), South Africa and South-East Asia (2003), China (September 2004), and Mexico (late 2005). The Fit's fuel tank under the front seat and compact rear suspension have enabled the rear seats to fold especially low, creating a flexible and regularised cargo volume that is large for its class. See: Honda Fit: diagram with forward fuel tank location and rear seat folded, into space typically occupied by the fuel tank. A production model for the United States and Canada debuted on January 8, 2006 at the North American International Auto Show in Detroit. The car was released in Canada on April 3, 2006, and in the U.S. on April 20, 2006 as a 2007 model year. In the North American markets, the first generation Fit was replaced after only two model years by a new 2009 model, which was released for Japan in November 2007 as a 2008 model. Subsequent iterations would maintain the same platforms worldwide. The first generation Fit was sold in 6 variations whilst its City/Fit Aria sedan sibling was sold in 4 variations. Depending on the region, the Fit is available with a 1.2-, 1.3- (in Europe referred as 1.4 L model), 1.5-liter i-DSI engine, or 1.5-liter VTEC engine. All four engines are based on Honda's L-series engine family. The eight-valve i-DSI (intelligent dual and sequential) engines use two spark plugs per cylinder, allowing gasoline to burn more completely; therefore, fuel consumption and emissions are reduced while maximum torque at mid-range rpm is maintained. The 1.5 L VTEC engine has the typical 16-valve configuration that can maximise output at high rpm. The engines are mated to a five-speed manual, five-speed automatic, and continuously variable transmission (CVT), depending on the region (CVT not offered in United States prior to 2015). Two forms of the CVT are offered: the regular, and the CVT-7. The CVT-7 offers a smooth, continuous flow of power, or seven simulated "gears" controlled by paddle shifters on the steering column. 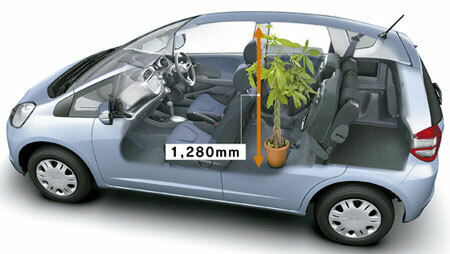 The Fit uses Honda's Global Small Car platform, which is also used by the Fit Aria/City (a sedan version of the Fit), the Airwave (a station wagon version of the Fit Aria/City), the Mobilio, and the Mobilio Spike. The Fit's central fuel tank location under the front rather than rear seats — combined with a compact, semi-independent, H-shaped torsion beam rear suspension — allows for a lower load platform and increased cargo volume. Noted for its "class leading utilization of interior space and maximum flexibility for people or cargo," the Fit offered approximately twice the storage space behind its rear seat compared with the Toyota Yaris hatchback. Utility: Either section (or both) of the 60:40 split rear seat folds and lowers onto itself, creating a flat load surface and increased cargo area. 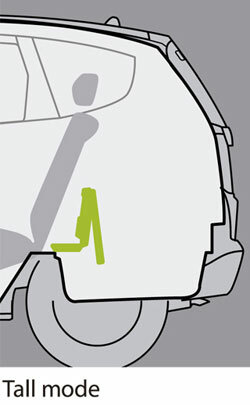 Long: The rear seat behind the passenger folds down similar to utility mode, but the front passenger seat folds backward, leaving an area that can hold items as long as 2.4 meters (7.9 ft). 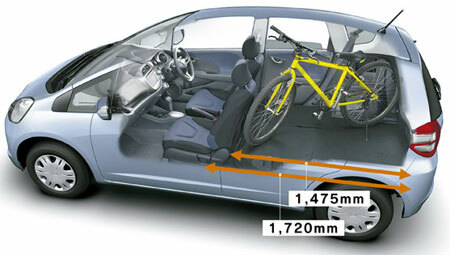 Tall: Either section (or both) of the rear seat cushion fold up against the rear seat back, allowing for an area of 1.28 meters (4.2 ft) in height. According to the Fit's chief engineer, Kohei Hitomi, the Magic/Ultra seating system's design "came about after the design team had spent long hours watching people in supermarkets and how they stored their things." Ultra Luggage: In certain markets, Honda offers the Fit/Jazz without a spare tire, a system marketed as Ultra Luggage, where the spare tire well is used as part of a 'Tall' mode cargo area behind the rear seats. A flexible flap allows three configurations of rear storage: Regular, Tall and Upper/Lower mode. The first generation Fit was produced at six locations, in Suzuka, Japan; Sumaré, Brazil; Guangzhou, China; Ayutthaya, Thailand; Karawang, Indonesia; and Laguna, Philippines. Models produced in Japan were for Honda's home market, Europe, some Asian markets, Australia (till the end of 2005), Canada and the United States. Models for the Malaysian, Singaporean and Vietnamese markets are produced in Thailand. The Brazilian factory supplied Mexico, all of Latin America and the Caribbean. Chinese models were sold in mainland China, and products from a dedicated export plant were exported to some left-hand-drive European markets, while Jazz models in Hong Kong were imported from Japan. Two engines (1.3 i-DSI and 1.5 VTEC) were offered, each with a number of trim lines ranging from the basic "Y" to the sporty "S". The 1.3 L i-DSI was available with only the regular CVT automatic. The 1.5 L VTEC model with the CVT-7 was added in September 2002. A five-speed manual was added in June 2004 for FWD model with the larger engine. Unique to the Japanese market, the Fit is also available in 4WD. Starting at a price of about JPY1,123,000 is the basic 1.3Y model. At the top of the range is the 1.5W four-wheel-drive version for JPY1,743,000. A bewildering range of options and accessories are available at most levels, including Honda's HDD GPS Navigation System called Internavi with its 6.5-inch (170 mm) colour screen. This system incorporates TV and FM radio. In Japan, the Fit replaced the market segment previously served by the Honda Civic and shared a platform with the Honda City when the Civic no longer complied with Japanese Government dimension regulations when the Civic exceeded the 1700mm width dimension. Like Japan, the European Honda Jazz also has two engines available. The European-only 1.2 i-DSI is offered as the base model in many countries, and can be purchased only with a five-speed manual transmission. The 1.4 i-DSI is identical to the 1,339 cc 1.3 i-DSI sold in Japan, but marketed as a 1.4 L to differentiate it from the smaller 1.2 L engine (at 1,244 cc, it is closer to 1.3 L than the bigger one is to 1.4 L). 1.4 L models started out well-equipped with the 5-speed manual standard and the CVT-7 available as an option. All European Jazz models have Anti-lock braking system (ABS) with disc brakes on the front wheels and drum brakes or disc brakes on the rear ones. Side airbags are standard on some high end models. The Honda Jazz has a good reputation in Europe with the UK's biggest automotive survey, performed by the motoring show Top Gear, revealing that the Honda Jazz was the second best vehicle on UK roads (after the Honda S2000), as voted by UK car owners in 2006. The popularity of the Jazz has made it Honda's best-selling model in the region, comprising 30% of all European Honda sales. 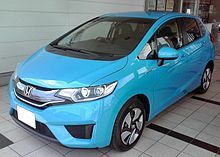 Top Gear also stated that Honda Jazz (and the Toyota Yaris) is the closest to reality car that money can buy, meaning that a Honda Jazz can cover the majority of the automotive needs that man has today. Local production and sale of the Fit (Hatchback) in China started in September 2004, roughly one year after the launch of the sedan version 'Fit saloon' (City/Fit Aria) in September 2003. The trims are similar to those in Japan; with the combination of 1.3 i-DSI, 1.5 VTEC, five-speed manual, and CVT, there are four models in total. The Fit went on sale in the United States and Canada in April 2006 for model year 2007, replacing the Civic hatchback for North America and becoming that market's chief entry-level subcompact. The Civic continues to grow in size and price and was reclassified as a compact (larger than a subcompact) in 2001. In keeping with Honda's safety initiative, the Fit was offered in North America with power windows, standard side airbags, side-curtain airbags, and ABS, in addition to the mandatory front airbags. Due to differing safety regulations, North American Fits have larger bumpers and a longer front clip than the rest of the world, resulting in a slight increase in overall length. For the 2008 model, US models feature the Tire Pressure Monitoring System (TPMS) to alert the driver of low pressure in any of the four stock wheels. Unlike some systems, the system in the 2008 Fit notifies the driver that a tire is low, but not which tire. The Fit narrowly missed qualifying for the Canadian government's $1,000 rebate, which is only offered for cars that meet the new federal fuel efficiency rating. Honda Canada Inc. decided to reimburse consumers the rebate for 2007, and a revision to the federal ratings allowed the 2008 Fit to qualify for the $1,000 rebate. The Fit was offered in two variants in the United States (Base and Sport), and three in Canada (DX, LX and Sport). Differences were primarily limited to cosmetics and standard equipment, since all models shared the same 1.5 L 109 hp (81 kW) engine and standard five-speed manual transmission. A conventional five-speed automatic transmission was optional, instead of the CVT automatic found throughout the rest of the world. The Fit Sport received paddle shifters mounted behind the steering-wheel when ordered with the automatic. For 2006, 27,934 Fits were sold in the United States. A total of 56,432 Fits were sold in the United States in 2007. The 2008 Honda Fit was largely unchanged from the 2007 with the exception of the TPMS and new windshield wipers that abandon the large rubber blade design to a more traditional rigid plastic with thin rubber blade design. MSRP was also increased by roughly US$100. Total sales in the United States for the year were 79,794, an increase of almost 41% over previous year. Honda marketed the Fit as "Small is the New Big".Car and Driver magazine described that "[n]ot only is it endowed with an impressive array of standard features and an upscale interior, but its dynamics rival the responses of cars with much fancier pedigrees and price tags." The magazine even cited its lane-change number of 71.4 mph edged the best run by a Ferrari F430 Spider F1 tested. And the car was included in Car and Driver's 10 Best Lists for three times. In May 2006, Fit was placed first in a Car and Driver comparison of seven economy cars that included Nissan Versa and Toyota Yaris. Consumer Guide said in its review, "While prices seem steep for a subcompact (compared to the Toyota Yaris and Nissan Versa), this is one in name and exterior size only; it's really a small wagon that challenges some compact SUVs for room while getting significantly better fuel economy". Fit, sourced from Brazil, was launched in October 2005. Fit is currently (2014) made in Mexico. Honda started local production and sale of Fit in April 2003 when Brazil became the second production base, after Japan, for Fit. In Brazil, though initially was available with the 1.3 L i-DSI engine only, eventually the Fit has the same engines as the Japanese models (all Brazilian Honda cars have engines imported from Japan) and there are three trim levels available. Base model LX features the 1.35 i-DSI engine (which is marketed as 1.4 in Brazil) and driver side airbag. The second model in the range, the LXL, features the same engine from the LX, but adds some extra equipment: passenger side airbag and ABS. Top model EX has essentially the same equipment as the LXL, but comes with the 1.5 VTEC engine. All models are available with the five-speed manual or the regular CVT automatic. 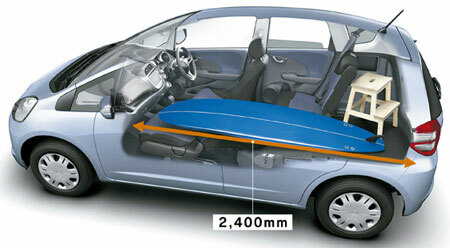 There are neither side airbags nor side curtains available for the Brazilian version. Also, the radio antenna is positioned differently, as it is near the front of the roof. Honda started selling the 2007 model in February 2006 with new bumpers and some cosmetic changes. Alcohol (ethanol) and gasoline hybrid Fit: Honda Brazil began sales in mid-December 2006, only for the 1.35 i-DSI. 80 hp (60 kW) at 100% gasoline and 83 hp (62 kW) at 100% alcohol. It also works with any intermediary mix rate. There is an additional gasoline fuel tank on the right side under the triangle window for low temperature starts. Honda Fit was awarded by Quatro Rodas magazine as Best Buy in 2005 and 2006, and as the car with happiest buyers in 2004, 2005, 2006 and 2007. Launched in 2003, it was sold as the Jazz in South Africa. It is available with the 1.3 i-DSI (badged as a 1.4) or 1.5 VTEC engines both offered with either manual or CVT (automatic) transmission. All Honda Fits sold in Chile are built in Brazil, except for a few early 2004 models. Until 2007, all three Brazilian trim levels were available LX, LXL and EX, with five-speed manual or CVT automatic transmissions, but for 2008 models, the 1.5-liter 16-valve VTEC engine is no longer available, while the Brazilian LXL, with 1.35-liter 8-valve i-DSI engine, is sold as EX. No alcohol powered engines are available in Chile. The Honda Jazz offering in Australia follows, to a degree, the Japanese versions (excluding the 4WD models), and was released in Australia in October 2002. The base model Jazz GLi is powered by a 1.34-liter i-DSI engine, and includes air-conditioning, a CD player, two front airbags, ABS brakes, EBD, a trip computer, remote central locking, a transponder coded immobilizer, power steering, windows and mirrors. Standard is a five-speed manual gearbox, with the CVT auto an optional extra. The VTi adds the 1.5-liter VTEC engine, "sports" trim, and side mirror-mounted turning indicators. Optional is the 7-speed version of the CVT auto with Formula 1 inspired gear shift paddles on the steering wheel; the VTi-S has a "sports" body kit, fog lights, and 15-inch (380 mm) alloy wheels. A "dot" on the "J" in Jazz on the rear of the first-generation model indicates whether it is powered by a 1.5- or 1.3-liter engine. The 1.5-liter version (VTi) has a blue dot and 1.3-liter version (GLi) has a red dot. The second-generation models can be differentiated by the presence (VTi) or absence (GLi) of audio controls on the steering wheel. The body kit for the VTi-S has changed since its introduction in 2003. The picture to the right illustrates the differences. The white Jazz VTi-S in the middle is a December 2003 model, while the left silver Jazz is a 2004 VTi with optional bodykit, the right silver Jazz is a 2004 model VTi-S. Since its introduction to Australia, the Jazz has been imported from Japan. However, in late 2005, Honda Australia began importing the Jazz from Thailand. The cheaper production costs allowed Honda to make significant price cuts across the Jazz range, although the color range has been reduced to six (compared to 12 in Japan). In 2006, the Australian Honda Jazz received a minor cosmetic facelift. At this stage, a free trade agreement between Australia and Thailand resulted all Australian Honda Jazz models being made in the Thailand factory. The model and trim variants remained the same, excluding the cosmetic changes. All Jazz models were upgraded to LED tail lights as standard and also the 1.3 L Gli Jazz models have its antenna mounted at the front just above the front windscreen. The VTi 1.5 L engine and body remained the same with the addition of a sports collapsible antenna mounting on the rear roof. The CVT paddle shift system was altered for easier use. The paddle system is down gears on the left and up gears on the right. The previous model had a shifter for both up down at the 3 o'clock and 9 o'clock positions. The VTi-S is mechanically similar to the VTi but has a sports body kit. In addition, the LED tail lights are smoked giving a more 'sporty' look. Post-2006 facelift Honda Jazz in Malaysia. The Malaysian version was available in two variants, the 1.5 i-DSI and 1.5 VTEC. Both are equipped with CVT-7 and are front wheel drive. No manual transmission is offered. Unlike the Australian market, which had different trims for the Jazz e.g., (GLi (Base Model with 1.3 motor), VTi (1.5 VTEC motor without Bodykit) and VTi-S (Sports Model with Bodykit)), the Malaysian Jazz models were either the 1.3 iDSi or the 1.5 VTEC. As of March 2003, a sole 1.4 i-DSi model was the only variant available. Standard equipment on both models includes air-conditioning, driver and front passenger air-bags, CD/radio head unit, ABS brakes, EBD, trip computer, central locking, power-assisted windows, power-assisted side mirrors, power-assisted steering, reflector halogen headlights, and folding seats. Optional extras can be purchased from Honda Dealers/Service Centers all around Malaysia at retail price. A three-year warranty is standard for all Jazz models purchased from authorized Honda dealers in Malaysia. Initially the Jazz was sold as a CBU model (fully imported from Japan) with a sole variant powered by a 1.3 i-DSI engine. Variants included the 1.3 i-DSi and the 1.5 VTEC model. In 2004, the 1.5 i-DSi models were imported from Thailand and 1.5 i-VTEC models were imported from Japan. Subsequently, Malaysia received units built in Thailand. The main and most noticeable difference were rear disc brakes. Japanese models incorporated rear drum brakes. In early 2006, the Jazz underwent a facelift (introduced earlier in Japan). The new version included new front fascia and bumpers, new rear bumper, new side skirts, side-mirror-mounted indicators/turn signals, rear LED brake lights, rear LED third brake light, body-colored housing headlights and minor interior changes. The motor remained unchanged. Sold as the Jazz in Singapore by the authorized dealer and Fit by parallel importers. 1.5 L i-DSI variant is offered for the Jazz while the Fit sold by parallel importers is available in 1.3 L only. CVT or five-speed manual transmissions are offered in Singapore. Introduced in November 2003 for local production and sold as the Jazz in Thailand. Thailand became the third production base to produce Fit, after Japan and Brazil. Initially it was available only with a 1.5 L i-DSI engine, which it shared with City (Fit Aria), and either a five-speed manual transmission or CVT. It is available in two variants, the 1.5 i-DSI and 1.5 VTEC. Both of them are FF layout with CVT-7 or five-speed manual transmission offered. The Jazz was first imported from Japan under the name Fit in 2002, but due to the high price it was not very popular. In late 2003, Honda decided to import the Fit from Thailand, badged as the Jazz, to Indonesia at a much lower price. After the release, the Jazz was an instant success and became the best-selling car in Indonesia after the Toyota Innova, Toyota Avanza and Daihatsu Xenia. It was offered in only one trim with the 1.5 i-DSI engine mated to either a 5-speed manual or a CVT transmission. In early 2005, a VTEC model was offered with added rear disc brakes, ABS, EBD and airbags. Since 2005, all Jazz models were built at Honda's Karawang factory. 2004 models were imported from Thailand, while 2005–08 models were built in Honda's plant in Laguna. Honda Jazz became the supermini to have the best overall performance for combined safety in its class. The second generation Fit/Jazz debuted on October 17, 2007 at the Tokyo Motor Show. At its introduction in 2007, it won the Car of the Year Japan Award for the second time. The vehicle offered a longer wheelbase than its predecessor and is wider and longer overall. Overall height is unchanged, while interior height increased by .3 in. Multi-mode seating and cargo configurations were retained (US models were no longer capable of Refresh/Relax Mode until the following gen), with redesigned headrests enabling more convenient folding of the rear seats. The cabin featured greater interior volume, and boot capacity decreased from 21.3 to 20.6 cubic feet (0.58 m3). Two engines were offered in the second generation Fit. A 1.3 L (79 cu in) i-VTEC produces 98 hp (73 kW) at 6,000 rpm and 98 lbf⋅ft (133 N⋅m) at 4,500 rpm. This engine was offered in both European and Asian markets. A 1.5 L (92 cu in) i-VTEC engine was also offered and produces a maximum output of 117 hp (87 kW) at 6,600 rpm and 106 lbf⋅ft (144 N⋅m) at 4,800 rpm. This was the only engine available in the American market. A five-speed manual, five-speed automatic (4WD only) and CVT transmission were available. We are very aware that the predecessor was a little firm, so we spent a lot of time fixing that. But we believe we've got it just right now. The second generation Fit featured improved ride and handling. 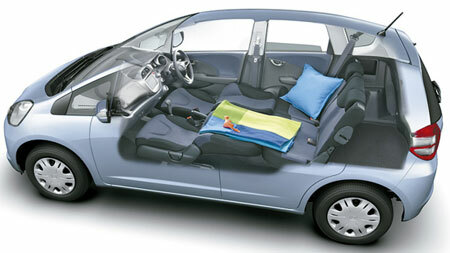 By 2012, the Honda Fit was produced in 12 countries, including Japan, Brazil, China, India and Indonesia. Sales of the Fit Hybrid began in Japan in October 2010. The hybrid version started at ¥1.59 million (around US$20,000), the lowest price for a gasoline-hybrid electric vehicle sold in Japan. The Fit Hybrid featured a 1.3-liter engine and electric motor, with an estimated fuel economy of 3.3 litres per 100 kilometres (86 mpg‑imp; 71 mpg‑US) measured in accordance with Japanese 10–15 cycle. The car used a parallel hybrid system that works in tandem with the gasoline engine. The parallel hybrid system is simple and lightweight while enhancing driving performance and fuel economy. The European version, called Jazz Hybrid, was unveiled at the 2010 Paris Motor Show and became available in early 2011. The Honda Fit/Jazz for the European and Japanese markets featured revised headlights, new front grille, a leather seating option and a new Lime Green exterior color choice. Fuel economy estimated in accordance with European standard is around 65 miles per imperial gallon (4.3 L/100 km; 54 mpg‑US) and CO2 emissions of 104 g/km. It has the lowest carbon emission of automatic car in the B-segment. When the car is driven in a low and steady speed, the car switches to EV mode and releases no carbon emission: the engine shuts down and the car is powered solely by the electric motor. In an interview, Kohei Hitomi, the project leader of Fit hybrid, admitted that lowering CO2 further will affect some attributes that buyers of the car value: a bigger electric motor and battery sacrifice spaces utility, and improving aerodynamics might make side mirrors smaller. He said there are benefits for customers to keep all the versatility. The drivetrain is the same drive system as the Honda Insight. The advantages of the system are low cost, low weight and that it can be combined with either manual transmission or continuous variable transmission. The car is better suited than its diesel competitors in areas where superminis are most common: city centres. It is more economical in urban conditions. Thanks to the instant torque of the electric motor, it has a much better engine response. "As for the future, it's open to question. We will carefully be watching the market situation." Hitomi, as reported by Automotive News, believed that the second generation Fit offered in North American market had very good fuel mileage as it was and questioned if buyers were willing to pay extra for marginal mileage gains. It is reported about 86,000 Fit Hybrid are sold in 2011. In Malaysia, the Fit hybrid was called Jazz hybrid. Honda introduced the hybrid model to Malaysia in March 2012. Honda had planned to produce the Jazz hybrid in Malaysia by the end of 2012. Honda was the largest hybrid vehicle seller in Malaysia in 2011 and by 2012 Malaysia was Honda's largest hybrid vehicle market in Southeast Asia. It was reported that Honda would introduce the Fit hybrid to China during 2012. The Jazz hybrid was launched in Thailand in July 2012, the first hybrid in the country's sub-compact market. First time buyers of the car were eligible for Thai government's first car tax rebate. The hybrid model is assembled in Thailand. New model of Fit Hybrid was launched in Japan in 2013. It is equipped with Honda's next-generation sport hybrid i-DCD system that combines a 97 kW (130 hp), 156 N·m (115 lb·ft) 1.5-liter direct injection engine combined with a 22 kW (30 hp) 160 N·m (118 lb·ft) Honda H1 motor. Powertrains are shared with Honda Vezel and Honda Grace Hybrid. The Fit Shuttle is a compact station wagon derived from the second generation Fit and is available in Japan's domestic market. The Shuttle is also a successor to the station wagon variant of first generation Fit, sold as the Airwave. The car leverages the efficient packaging of Fit and Fit hybrid. The launch of the car in June 2011 was pushed back from March as a result of the earthquake and tsunami in Japan on March 11, 2011. Production of the car was transferred from Honda's Sayama plant in Saitama Prefecture to Suzuka plant in Mie Prefecture as a result of power rationing after the quake. Production began in early May 2011. The Fit Shuttle was shortlisted for Car of The Year Japan 2012. Its drivetrains are shared with the Fit. The Fit Shuttle has a 1.5 L i-VTEC engine with 120 hp (89 kW), which is optional in Japan's Fit. A hybrid version, the Fit Shuttle hybrid, is also available, with a 1.3 L i-VTEC engine with IMA. Continuously variable transmission is the only transmission available for FWD models. A five-speed auto transmission is standard on four-wheel-drive models. Japanese sales began in October 2007. Facelifted models, and the hybrid version, arrived in October 2010. Models available in Japan are the 1.3 L and 1.5 L variants consisting of the 13G, 15XH and the top-of-the-line RS. In 2007, aftermarket tuner Mugen, introduced a new line of accessories for the Japanese market 2008 Honda Fit. On 17 January 2008, they introduced the Mugen Fit F154SC at the 2008 Tokyo Auto Salon. The F154SC has a supercharger installed onto the stock L15A engine that raises base horsepower of the 1.5 L (92 cu in) I4 to 150 hp (112 kW) and 136 lb⋅ft (184 N⋅m). Other upgrades include full coilover suspension, exhaust, intake, and brakes. Body modifications include a widened track to feed more air into the engine bay. Although the second generation Honda Fit was introduced in the Japanese market in 2007, the first generation Fit was still sold in the North American market for the 2008 model year. The second generation Fit for the North American market was unveiled on March 19, 2008, at the 2008 New York International Auto Show for the 2009 model year. 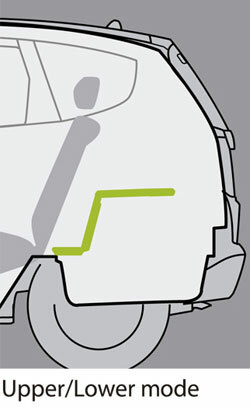 The North American Fit's front overhang is several inches longer to improve U.S. National Highway Traffic Safety Administration (NHTSA) crash test ratings. The engine is a 1.5 L (92 cu in) i-VTEC 4-cylinder with 117 horsepower at 6600 rpm mated to a five-speed manual transmission or a five-speed automatic transmission. The second generation Honda Fit went on sale in North America on August 26, 2008, for the 2009 model year. It was considered the most expensive within the subcompact class when equipped as such, but was also described as modestly priced. It was reported in September 2009 that Honda is considering producing the Fit in North America in response to the increasing strength of the Japanese yen against the U.S. dollar. For the 2011 models, Vehicle Stability Assist, cruise control, remote entry and USB audio interface became standard across all trim levels. In addition, the Fit Sport now comes with carpeted floor mats. As of the 2011 model year, the base Fit comes with a remote entry, 15-inch wheels with covers, power windows, power locks, cruise control, a tilt and telescoping steering wheel, a 160-watt AM/FM/CD audio system with four speakers, a USB audio interface, a 12-volt power outlet, and other features. The Fit Sport adds a ground appearance package, 16-inch (410 mm) alloy wheels, paddle shifters, a navigation system, a security system, fog lights, chrome exhaust finisher, a leather-wrapped steering wheel, steering wheel-mounted audio controls, floor mats, a 6-speaker AM/FM/CD audio system, and other features. For 2012, the Fit features revised floor, front fenders, A-pillars, and front corner-window glass. The Fit Sport features a revised grille, dark "machined surface" finish alloy wheels, a black monochrome theme interior with chrome accents. The base model receives body-color exterior mirrors (previously black), standard security system and new wheel covers for 2012. Canadian trims include the DX (two speakers, black door handles and side mirrors), DX-A (adds factory-installed air conditioning), LX (adds among other things, body-colored door handles and side mirrors, 15-inch lightweight alloy wheels from the 2006–11 Civic Hybrid and DX-G, rear spoiler, power locks and remote entry, two speakers for a total of four, cruise control), and Fit Sport (adds USB jack and Vehicle Stability Assist). The Fit Sport is similar to its American counterpart, however a navigation system is not offered as an option. There are plans to build subcompact cars, which many rumoured to be Fit, in Honda's new plant in Mexico. The Sumare-built new Fit was introduced in October 2008 in Brazil at the Sao Paulo Auto Show. There are four versions: LX and LXL, with the 1.35-liter (marketed as 1.4) 16V engine, and EX and EXL, with the 1.5-liter 16V engine. Both engines have VTEC and flex fuel capabilities as standard. Manual and automatic – both five-speed – gearboxes are offered; CVT is no longer available. 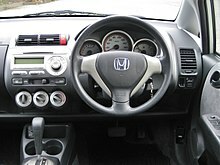 The second generation Fit was launched as the Jazz in Malaysia in August 2008. Two models were available: Grade S and Grade V. In June 2009, a limited edition Grade S Modulo variant was launched limited to 100 units. In April 2011, the facelift model was officially launched with a sole Grade V variant being available. In August 2012, the sole Grade V variant was replaced with a Grade S variant that saw a reduction in price and a reduction in equipment. Lastly, in July 2013, Jazz was sold in Malaysia as a locally assembled model. Thus far, second generation Jazz's had been fully imported from Thailand. Only one variant was available though dubbed Grade S. It comes in a blue-black fabric upholstery for the interior, 4-speakers, a CD/MP3/WMA player with USB and AUX jack, immobiliser and 4 corner reverse sensors. All second generation Jazz sold in Malaysia came with a 1.5 L i-VTEC engine with an automatic gearbox. The 2008 Fit is available from parallel importers and the authorized dealer in Singapore. The parallel import Fit is available in 1.3 G and GF that comes with an optional sunroof and the 1.5 RS version which packs 120 PS. The RS version has different bumpers, bigger 16-inch rims and has smoked LED tail lights. The authorized dealer sells the Jazz in two variants 1.3 L and the 1.5 L having similar specifications as the parallel imported Fit but does not adopt the RS grade for the 1.5 model. The Jazz was launched later from the authorized dealer in 2009. The Fit is available in Thailand as the Jazz. The second generation model has been unveiled on March 23, 2008. 3 trim levels will be offered with S, V and SV. Cars with the S trim level will have 5-speed manual and 5-speed automatic transmission while the V and SV trims with only automatic transmissions. All trim levels have the 1.5-liter 16V engine with i-VTEC, ABS and CD/MP3 radio. Jazz in Thailand gets a facelift in January 2011 with new front grille and rear bumper, sees an addition of front dual airbags across the range and front fog lights in SV models. In early 2012 Thai government allowed to import Jazz (and Accord) from Japan to serve buyers in Thailand without excise tax, due to the flood in Honda plant in Ayutthaya province; the Japanese spec Fit came with HID headlights and 6 airbags. The Jazz hybrid was launched in Thailand in July 2012, the first hybrid in the country's sub-compact market. First time buyers of the car are eligible for Thai government's first car tax rebate. The Jazz that is built in Thailand will be shipped to serve customers in Malaysia, Philippines and Australia. The second-generation Jazz was launched around October 2008, with two trim levels; available in 1.3 S and 1.5 V models. The 1.3.S is available in 5 speed manual or 5 speed automatic while the 1.5.V is only available in 5 speed automatic with paddle shifters and receives a different style alloy wheels fog lights is not installed between the two trims it is a choice for the owners to add fog lights to the Jazz in 2011 a facelift version has launched receiving new designed front bumpers for both 1.3. And 1.5. Variants and new designed alloy wheels for both variants fog lights is now available in the 1.5. Variant and new colors has been added Brilliant Orange (1.5.V only) and Fresh Lime for both variants. Similar with Thailand, the Honda Fit is called the Honda Jazz. The general market for the Honda Jazz are students, urban-people, and small families who needed a small, fuel-efficient, Spacious Cabin and trendy car. The first generation Honda Jazz was a huge success, sold by Honda Prospect Motor (HPM) introduced in late quarter of 2003. The Honda Jazz is manufactured completely knocked down (CKD) in Honda's Karawang Plant, West Java, Indonesia. The second generation Jazz was launched on June 27, 2008, sold in S and RS (Road Sailing) versions. The RS has added airbags, ABS, EBD, a different head unit and body kit with bigger wheels. In 2008, the total sales of Honda Jazz in Indonesia was 24.969 unit, ranked 5th in total for the best-selling passenger car in Indonesia. In 2009, sales fell to 15,713 as economic activities slowed but sales ranking improved to the fourth best-selling passenger car of the country. It was also Honda's best-selling car in Indonesia. As of the end of November 2010, sales of Jazz totaled 20,581 unit for the year. As of the June 2014, totaled 228.500 unit Honda Jazz were sales (from early 2004), making the car leader in the segment. In mid-2011, the Jazz underwent a minor change including the redesigned front grill, new front/rear bumper, and a LED taillights. In early 2013, the Jazz went a minor changes including new headlight and taillights accent, added upper spoiler as standard, new wheels, new audio system, and 'RS' badge on the grille. The S trim received chrome grille. Launched as Jazz in India in June 2009 with 26 per cent import content. It is manufactured by Honda Siel Cars India Limited at its factory in Greater Noida. In India the car is powered by 1.2 L i-VTEC engine. Honda Cars India postpones Next-Gen Jazz launch citing production limitations. Honda expects the launch of Next-Gen Jazz in India sometime during the next fiscal in 2015. 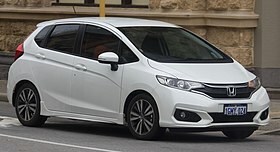 The second generation Fit (sold as the Jazz) is available in Australia, albeit initially without electronic stability control (known as Vehicle Stability Control in Honda nomenclature). Honda introduced the feature at the end of 2010. Stability Control has since become standard on all Jazzes sold. Until the end of 2011 the Australian Jazz was sourced from Thailand. However, due to the 2011 flooding in Thailand, Honda Australia sourced two special editions of Jazz from Japan from early 2012 until Honda's plant in Thailand resumed production. The Japan-produced Vibe and Vibe S replaced the existing GLi and VTi prefixed models. On July 28, 2008, Honda UK announced that the second generation Jazz would be on sale from October 17, 2008. The new model will be sold with two new engine variants; a 90 PS 1.2-liter i-VTEC gasoline capable of 55.4 miles per imperial gallon (5.10 L/100 km; 46.1 mpg‑US) (combined) and with low CO2 emissions of 120 g/km; and a 100 PS 1.4-liter i-VTEC gasoline engine capable of 53.3 miles per imperial gallon (5.30 L/100 km; 44.4 mpg‑US) (combined) and with similarly low CO2 emissions of 123 g/km. Honda also announced the introduction of an optional new "I-SHIFT" semi-automatic gearbox replacing the traditional automatic CVT gearbox that had been available on the previous model. Production of the Jazz for European markets moved from Japan to Honda's UK plant in Swindon on October 7, 2009. Facelifted models and the new hybrid model went on sale on February 1, 2011. Aerodynamics improvement help the Cd drop from 0.336 to 0.330. Engine modifications result in a drop of carbon emission of two grams to 123 g/km for 1.2 L engine and 126 g/km for 1.4 L engine respectively. CVT transmission will also be available on cars with the larger engine. The third generation Fit/Jazz retains the overall design concept of previous generations, notably the center-located fuel tank and multi-configuration interior concept, marketed as Magic Seating. Honda's all-new "Global Small Car Platform" employing ultra-high strength 780 MPa yield steel for 27% of its bodywork — and a shorter overall length (-1.6 inches), longer wheelbase (+1.2inch) increased rear legroom (+4.8 inches) and increased passenger volume (+4.9 cu ft) compared to its previous generation. Japan models went on sale on September 6, 2013. Models available in Japan range from the 13G, 15X, RS and hybrid. Compared to the outgoing IMA hybrid, the new hybrid can now run fully on electric while driving, making it on par with Toyota Prius. Japanese cycle fuel consumption go as low as 37 km/L for the facelift base model. Non-hybrid models include the 13G (Earth Dreams 1.3-liter Atkinson cycle DOHC i-VTEC engine and CVT transmission), 15X (Earth Dreams 1.5-liter direct injection DOHC i-VTEC engine), RS (Earth Dreams 1.5-liter direct injection DOHC i-VTEC engine). The RS variant just like the outgoing model, features cosmetic enhancements featuring a sporty all round bodykit, 16 inch wheels, red interior stitching and sports pedals. The U.S. model debuted at the 2014 North American International Auto Show and went on sale in June as a 2015 model year vehicle. The third generation model replaces the previous SOHC engine with an all-new 1.5-liter DOHC i-VTEC engine featuring direct injection and an intake cam using continuously variable cam phasing with a variable lift dual cam lobe profile. Transmission options include a 6-speed manual or continuously variable transmission (CVT) with available paddle shifters adopted from the Civic. Fuel mileage ratings for automatic models are 33/41/36 mpg (LX model, city/highway/combined) or 32/38/35 mpg (EX and EX-L trim levels). All Fits trim levels include a multi-angle rear-view backup camera; higher trims include dynamic guidelines. Honda's LaneWatch passenger side-view mirror camera is also optional. Malaysian third-gen B-segment hatch Honda Jazz is available in S, E and V variants. Regardless of which variant, all variant get a non-direct-injected 1.5-liter SOHC i-VTEC engine developing 120 PS at 6,600 rpm and 145 Nm of torque at 4,600 rpm (200 rpm lower than in the outgoing Jazz) and an ‘Earth Dreams’ CVT. The third generation Honda Jazz was launched by Honda Prospect Motor on June 26, 2014. It is available in three types: the A, S and RS, with either manual or CVT transmission, and a special edition called Black Top Limited Edition which was launched at the 22nd Indonesia International Motor Show in September 2014. It underwent two minor changes, first in 2016 where it was fitted with a new "floating" audio head unit design, added padding on passenger airbag, and redesigned wheel. In 2017, the RS is fitted with new LED headlights and underwent some cosmetic changes. The new-generation Honda Jazz was rolled out on July 8, 2015 from the stables of Japanese automaker in India. Powering the new-gen Honda Jazz is a 1.2-liter, i-VTEC motor churning a peak power of 90 ps and a 1.5-liter i-DTEC, Earth Dreams diesel engine having a power of 100 ps. India is the first and the only market where Jazz has been offered in diesel as well. The diesel engine is mated to a 6 speed manual transmission. The hatchback has been offered in 5 regular variants (E, S, SV, V and VX) in manual transmission and 2 variants (S and V) in CVT (continuously variable transmission). The upper V trim in CVT comes with first in segment, steering mounted paddle shifters offering 7 virtual manual selection. At the time of launch, the lowest E variant in gasoline was priced at 5.31 lakhs while the top end VX variant was priced at 7.29 lakhs (ex-showroom, New Delhi). The E variant in diesel was tagged at 6.5 lakhs while VX diesel priced 8.59 lakhs (ex-showroom, New Delhi). In the Philippines, the third generation Honda Jazz was launched in 2014 available in three trims; the base which is the 1.5E available in 5 speed manual or CVT. The manual variant receives a steel wheel rim cover while the E CVT receives a different wheel design, the high-end variants 1.5VX and 1.5VX+ receives unique designed alloy wheels, touch-screen panel with AUX/USB connection, HDMI connectivity, HSA (hill start assist), VSA (vehicle stability assist), smart key w/push start/stop button, automatic climate control, mirror with side turning lights, center console with armrest and ESS(emergency stop signal) the VX+ receives side-curtain airbags, and all models receive ECON button, sporty illumination gauge and the four types of modes; Utility, Long, Tall and Refresh mode. The third generation Fit/Jazz received a facelift which was unveiled in Japan on May 12, 2017 and went on sale on June 29, in Thailand on May 19 and in Malaysia on June 6. The US model was unveiled on June 12. The facelifted third generation Jazz RS was also launched in Indonesia on July 26. The facelift features new bumpers for the 1.3L and 1.5L, LED headlights and daytime running lights incorporated into the headlights. Japanese sales of the first generation Fit greatly exceeded the original monthly sales target of 8,000 units on debut. By December 2001, it had outsold the Toyota Corolla, and ranked first in sales for nine out of twelve months in 2002. With a total sales of 250,790 for the year of 2002, it became the best-selling vehicle in Japan, which is a first for a Honda model. By September 2003, a little more than two years after the car was first sold, Fit reached 500,000 sales in Japanese market. After a minor model change that went on sale on June 11, 2004, Honda announced that, in about 2 weeks' period after its introduction, the company received orders from customers totaled around 13,000 units. By November 2007, in less than 6 months after minor model change, cumulative sales of Fit reached one million units in Japan. The second generation has been the top selling car in Japan since its official launch in November 2007. By September 2010, cumulative sales in Japan reached 1.5 million units. By December 2004, cumulative global sales of Fit/Jazz reached 1 million units. On July 17, 2007, Honda announced that as of the end of June more than 2 million Fit/Jazz units had been sold worldwide since its introduction. Japan accounts for the largest percentage of sales, with 962,000 units sold in the home market. Europe is next with 417,000 units. The U.S. accounts for 77,000 cars since introduction in 2006. Honda expected to sell 33,000 vehicles in the U.S. for the 2007 model year, but exceeded these expectations and sold 40,000. Honda plans to put 70,000 Fits on the U.S. roads for the 2008 model year. In the first half of 2008, Honda and other manufacturers were surprised by the rapid shift towards smaller cars in the United States. Sales of Fit during the first five months of the year jumped 64% compared with that of 2007. Production of 2009 Fit for the United States market was to increase from 60,000 to 80,000 cars. Further increase in supply for the United States market is limited by Honda's production capacity of 500,000 a year for all markets. Honda announced that by the end of July 2009, worldwide sales of Fit/Jazz reached 3 million. One year later, global cumulative sales reached 3.5 million units in July 2010. In April 2006, Honda Australia started promoting the Honda Jazz with Village Green, an animated television commercial, in 30 second and 60 second versions. The 60 second ad was inspired by Thomas the Tank Engine. The campaign was developed by Foote Cone Belding Melbourne, by creative director/art director Scott Lambert, copywriter Mark Ringer and agency producer Mandi Wright. The animated ad was directed by Michael Cusack at Anifex, with director of photography/producer Richard Chataway. In April 2006, American Honda and its ad agency RPA launched the all-new small car, the Honda Fit, with six five-second and two 30-second TV ads, with the slogan 'The Fit Is Go'. These ads ran only briefly as demand quickly outstripped supply. In September 2008, RPA (Rubin Postaer and Associates) announced it had started a national advertising campaign for Honda Fit, beginning September 29. The list of ads include "Mecha-Mosquitoes," (broke 9/21) "Defense Mechanism" (breaks 10/2) and "Bats" (breaks 9/28), produced by Digital Domain. As part of the campaign, the vehicle also appeared in Gossip Girl, 90210, America's Next Top Model, Smallville and Everybody Hates Chris. Print ads "Gas Hogs" and "Cavernous" will be featured in popular magazines. A dedicated marketing site was built to communicate top product features through games and interactive experiences. The campaign continued the slogan 'The Fit Is Go'. The Honda Fit EV concept electric car has its global debut in the 2010 Los Angeles Auto Show. The concept uses a motor derived from the FCX Clarity hydrogen fuel cell vehicle that, in sport mode, gives the driving feel of a car with a 2-liter gasoline engine. The vehicle is paired with an exclusive interactive key fob that enable the driver to view the battery's state of charge, initiate charging, and activate the vehicle's climate control all without a cell-phone or an Internet connection. The vehicle can also pair with mobile app and web site that allows drivers to set the vehicle's charging schedule for the best utility rates, locates charging stations and provides 24/7 roadside assistance. Honda started the Electric Vehicle Testing Program in the cities of Saitama, Kumagaya and Chichibu, Saitama Prefecture, and Amakusa area, Kumamoto Prefecture, Japan, for its next-generation personal mobility products, including Fit EV in December 2010. A demonstration program with pre-production vehicles began in Guangzhou, China in early November 2011. Another program, called Honda Electric Vehicle Demonstration Program, is taking place in California, in partnership with Stanford University, the city of Torrance and Google. The electric vehicle joins Google's GFleet, a car-sharing service for employees. Stanford uses the electric vehicle to study differences in the psychological and physical reaction of using battery-electric vehicles and driving a traditional gasoline-powered vehicle. The first 2013 Fit EV demonstrator was delivered to the city of Torrance in January 2012. Stanford and Google received their demonstrators in February 2012. The production 2013 model year Fit EV was unveiled at the November 2011 Los Angeles Show. Vehicles for the U.S. market were limited to 1,100 units through October 2014. Honda began deliveries of the Fit EV in the United States in July 2012, and the car was available only through leasing at a price of US$389 per month for three years, based on base price of US$36,625, and later the monthly lease payment was reduced to US$259 for all customers effective from June 2013. Initial availability was limited to California and Oregon, and sales were scheduled to begin in selected markets in Massachusetts, Connecticut, Maryland, New York, and New Jersey by late February 2013. Certified dealers for Fit EV increased from 36 to 200 by the middle of 2013. The Fit EV was released through leasing to local government and corporate customers in Japan in August 2012. Availability in Japan was limited to 200 units during its first two years. The car is based on the Fit compact car platform, powered by a lithium-ion battery pack combined with an AC synchronous, permanent magnet coaxial traction motor and low-friction reduction gearbox borrowed from the Honda FCX Clarity hydrogen fuel cell vehicle. Honda said the Fit EV concept had an all-electric range of 70 to 100 miles (110 to 160 km) and a top speed of 90 miles per hour (140 km/h). Honda also said that recharging the Fit EV will take 12 hours from a 120-volt outlet and four hours with a 240-volt supply. The United States Environmental Protection Agency official range is 82 mi (132 km) and the agency rated the Fit EV combined fuel economy at 118 miles per gallon gasoline equivalent (2.0 L/100 km), at the time, the highest of any electric car available in the U.S. market, topping the Mitsubishi i MiEV, rated with a combined 112 MPGe (2.1 L/100 km). The Fit EV was surpassed in December 2012 by the Scion iQ EV, a two-seater, with a rating of 121 MPGe combined. Energy consumption is 29 kW·h per 100 miles, and the fuel economy rating for city driving is 132 MPGe (1.8 L/100 km) and 105 MPGe (2.2 L/100 km) for highway. Under the Japanese JC08 test, the Fit EV achieved the current best AC energy consumption rate of 106 Wh/km and a range of 225 km (140 mi). The Fit EV employs Toshiba's SCiB batteries that can be recharged to 80% capacity in 15 minutes and can be recharged up to 4,000 times, more than 2.5 times that of other Li-ion batteries. The battery cells use lithium titanate oxide in the anode, providing rapid charge times and extending battery life. It also provides stable discharge from extremely cold (-30 °C) to high temperature above 40 °C. According to Honda, the SCiB battery can charge in about half the time of a typical Li-ion battery. The Honda Fit EV, like the Honda CR-Z hybrid, will have three distinct driving modes: econ, normal, and sport. Honda explained that "econ" mode will extend the driving range by 17% compared to the normal mode; in sport mode, the Fit EV imitates the acceleration of a small car with a 2.0-liter gasoline engine. The production version is equipped with a 20 kWh lithium-ion battery and 92 kW coaxial electric motor. The new electric motor is up to 98 percent efficient, contrast to the typical 15 percent efficiency of a gasoline engine. Honda estimates the Fit EV range at 123 mi (198 km) for city driving, and 76 mi (122 km) for combined city and highway. The battery can be recharged in four hours from a 240-volt outlet. In July 2014, Honda announced the end of production of the Fit EV for the 2015 model, together with the Honda Insight hybrid and the Honda FCX Clarity hydrogen fuel-cell car. A total of 1,070 new units were leased in the U.S. through April 2015. In March 2015 Honda offered a two-year lease extension to existing lessees, and also to new customers on used cars, at a reduced priced of US$199 a month with no down payment. In both cases there is no purchase option at the end of the lease. Car and Driver's Best Small Car in its 2007–13 10 Best lists. The Honda Fit was one of the cars listed as eligible for the SCCA World Challenge's touring car B-spec class for the 2012 season onward. Fit engines are also used in another SCCA class, the F1600 Championship Series. ^ "Honda Begins Sales of All-New Fit and Fit Hybrid in Japan". Honda Motor (Press release). 2010-10-08. Archived from the original on 2014-10-24. ^ Yoshio, Takahashi. "Honda Fit to Break Civic Record?". The Wall Street Journal - Japan Real Time. Dow Jones. Retrieved 15 July 2014. ^ Lim, Anthony (18 July 2012). "Nissan Note – second-gen mini MPV debuts". paultan.org. Archived from the original on 3 February 2014. Retrieved 3 February 2014. Nissan has announced the arrival of an all-new Note, and the second-generation mini MPV will take the fight to the likes of the Honda Jazz in Japan, beginning early September. ^ Lyon, Peter (12 November 2002). "Mitsubishi Colt". Auto Express. Archived from the original on 3 February 2014. Retrieved 3 February 2014. Outside, the Colt is slightly bigger than key rival the Honda Jazz in virtually every department. Crucially, though, it still fails to outclass the Honda in terms of cabin space. ^ a b Eric Loveday (Oct 8, 2010). "Honda prices 2011 Fit Hybrid at $19,310; cheapest gas-electric in Japan". Autoblog Green. ^ a b Williams, Stephen (2010-08-25). "Honda Jazz Hybrid Will Get Paris Premiere". New York Times. Retrieved 2010-08-26. ^ a b Zach McDonald (2012-07-20). "Honda Registers First Fit EV Delivery". Plugincars.com. Retrieved 2012-07-21. ^ a b c Honda News (2012-08-31). "Honda begins lease sales of Fit EV in Japan". Green Car Congress. Retrieved 2012-09-11. ^ "2007 Honda Fit". Topspeed. In order to help maximise Fit's useable interior space, Honda located the fuel tank in a central location towards the middle of the vehicle. 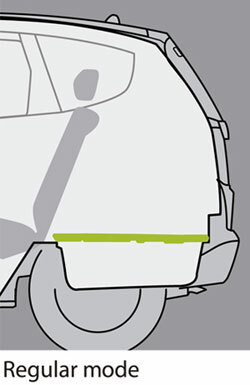 This allows the cargo floor in the rear of Fit to be relatively low, thus increasing the interior volume. ^ "Honda's Next Generation of Outboards". Retrieved 2008-06-16. ^ a b "2007 Honda Fit". Top Gear, 05.16.2006, Mike Huslea & Anthony Kodack. ^ a b "2007 Honda Fit Review". JB car pages. Retrieved 2009-03-09. ^ "Test Drive: 2007 Honda Fit Sport". Canadian Driver, Greg Wilson, April 21, 2006. ^ a b "Second Generation Honda Jazz". Motortrader.com, August 20, 2008. Archived from the original on May 21, 2009. ^ "New Second Generation Honda Jazz Details". Paultan.org, October 22, 2007, Paul Tan. ^ "Honda Automobile (China) Co., Ltd. Begins Auto Exports". Honda. 2005-06-24. Archived from the original on 2009-05-16. Retrieved 2010-01-20. ^ "Honda Adds a 1.5L Model to the Popular "Fit" Small Car Line-up". Honda. 2002-09-12. Archived from the original on 2016-03-02. Retrieved 2010-01-20. ^ "Top Gear Survey 2006 - Honda Jazz". Archived from the original on 2007-10-11. Retrieved 2008-01-14. ^ "Honda Begins Production of "Fit" Hatchback in China". Honda. 2004-09-13. Archived from the original on 2016-03-02. Retrieved 2010-01-20. ^ "2008 Honda Fit Review". JB car pages. Retrieved 2009-03-09. ^ Vander Doelen, Chris (April 5, 2007). "Honda Fit may drop safety for rebate". Vancouver Sun. Archived from the original on January 24, 2008. Retrieved 2008-12-28. ^ Lavrinc, Damon (2007-07-09). "Mazda still mulling over Mazda2, while Honda dealers clamor for more Fits". Autoblog. Retrieved 2007-07-09. ^ a b "American Honda Reports 2008 Annual and December Monthly Sales" (Press release). Honda. 2009-01-05. Archived from the original on 2010-01-06. Retrieved 2010-03-18. ^ "2008 Honda Fit Subcompact Proves that Small is the New Big". The Auto Channel. 2007-09-10. Retrieved 2008-12-28. ^ Csaba Csere and Tony Swan. "2007 10Best Cars - 10Best Cars". Car and Driver. Archived from the original on 2011-10-08. ^ "Decade in Review: 10Best of the Aughties - Feature". Car and Driver. December 2009. Archived from the original on 2011-09-26. ^ JOHN PHILLIPS (May 2006). "2007 Dodge Caliber vs. 2007 Honda Fit, 2006 Hyundai Accent, 2006 Kia Rio5, 2007 Nissan Versa, 2006 Suzuki Reno, 2007 Toyota Yaris". Car and Driver. Archived from the original on 2008-09-17. Retrieved 2008-12-28. ^ "2009 Honda Fit Full Review". Consumer Guide Auto. 2008-11-25. Archived from the original on 2009-01-11. Retrieved 2008-12-28. ^ Amyot Bachand (2008-06-26). "2008 Honda Fit LX Review". Auto123.com. Retrieved 2008-12-28. ^ "Honda Annual Report 2006". Honda Motor Company. Archived from the original on September 5, 2008. Retrieved 2010-01-20. ^ Los Angeles Times (24 February 2014). "Mexico becoming a driving force in auto production". latimes.com. ^ "Sales of Locally Produced Honda Fit to begin in Brazil". Honda. 2003-04-22. Archived from the original on 2016-03-02. Retrieved 2010-01-20. ^ 3348 (2003-03-12). "JAZZing up Honda's Range in Malaysia". Autoworld.com.my. Retrieved 2019-03-05. ^ TheGunner (2009-04-21). "Honda Jazz Owners Give Testimonials". Autoworld.com.my. Retrieved 2019-03-05. ^ 3348 (2004-04-22). "Honda Malaysia Launches Two New Jazz Models". Autoworld.com.my. Retrieved 2019-03-05. ^ khong, ys (2006-08-16). "Jazzier Honda Jazz Unveiled by Honda Malaysia". Autoworld.com.my. Retrieved 2019-03-05. ^ "Honda Begins Production and Sales of Small Car "Jazz" in Thailand". Honda. 2003-11-18. Archived from the original on 2016-03-02. Retrieved 2010-01-20. ^ "Safercar.gov 2007 Honda Fit 4-dr w/SAB". Safercar.gov. Archived from the original on 2012-03-10. Retrieved 2010-10-23. ^ "Honda Jazz - test 2004". Euro NCAP. Retrieved 2010-10-23. ^ "Jazz Safety "Top of the Class"". Autoweb. 2004-07-01. Archived from the original on 2016-03-03. ^ Tadeo, Patrick Everett (2013-03-29). "Do the Thais Know Something That We Don't?". Top Gear Philippines. Retrieved 2013-06-03. ^ "2008 Honda Fit Specs". JB car pages. Retrieved 2009-03-09. ^ a b "2009 Honda Fit Specs". JB car pages. Retrieved 2009-03-09. ^ a b Lyon, Peter (2007-09-20). "First Drive: 2009 Honda Fit – The Big Success Gets Bigger". Edmunds. Archived from the original on September 26, 2007. Retrieved 2007-09-23. ^ Kubota, Yoko (Sep 21, 2012). "Honda aims to nearly double car sales in four years". Reuters. Retrieved 19 February 2017. ^ a b c d "Honda announces the new Jazz Hybrid, the first hybrid model in the Thai sub-compact automobile market segment" (Press release). Honda Automobile (Thailand). Jul 28, 2012. ^ Lee Sibbald (2010-09-30). "Honda's Jazz hybrid becomes lowest CO2 emitting automatic B-segment car". The Fleet Directory UK. ^ "Lower-emission Jazz to come, says Honda". What Car?. 2010-09-30. Archived from the original on 2012-03-06. ^ Richard Aucock (2010-09-30). "Paris: Honda defends Jazz Hybrid". Car Dealer magazine UK. Archived from the original on 2012-03-02. ^ "Honda Flip-Flops on U.S. Release of Honda Fit Hybrid". Hybrid Cars.com. 2010-10-11. ^ "Honda to assemble hybrids in Thailand". Reuters. May 17, 2012. ^ Premalatha Jayaraman (Mar 16, 2012). "Honda aims to sell 10,000 hybrid vehicles this year". The Sun Daily. Archived from the original on 2012-09-14. ^ "Honda to begin Jazz hybrid production in Malaysia; adding second production line". Green Car Congress. Jul 19, 2012. ^ "Honda to introduce three hybrids to China market this year, local production of EVs". GreenCarCongress. Apr 10, 2012. ^ a b c d "Honda Jazz Hybrid sub-compact launch for a clean and green future". Rush Lane. Jul 28, 2012. ^ a b "Honda Jazz Hybrid at Bt768,000". The Nation. Jul 26, 2012. ^ "Honda begins assembling Fit Hybrid in Thailand". GreenCarCongress. Jul 27, 2012. ^ a b "Honda begins sales of new Fit Shuttle and Fit Shuttle hybrid in Japan; same fuel economy as smaller Fit". Green Car Congress. 2011-06-16. ^ "Honda To Launch Fit Wagon After 3-Month Delay". Nikkei. 2011-05-21. Retrieved 2011-11-30. ^ Jeff Glucker (Jun 16, 2011). "Honda Fit Shuttle goes on sale in Japan in gas and hybrid spec". Autoblog. ^ "Car of the Year Japan 2012 Top Ten Contenders Announced". Integrity Exports. 2011-11-14. Retrieved 2011-11-14. ^ "Shuttle Liftoff: Honda Fit Shuttle Hits Dealers in Japan, Rakes In 7000 Orders". Automobile Magazine. 2011-06-16. ^ Neff, John (2007-10-22). "Mugen lays hands upon 2008 Honda Fit/Jazz". Autoblog. Retrieved 2007-10-24. ^ Lavrinc, Damon (2008-01-17). "Honda Fit F154SC concept by Mugen". Autoblog. Weblogs, Inc. Retrieved 2008-01-17. ^ Ramsey, Jonathon (2008-03-19). "New York 2008: 2009 Honda Fit gets in shape". Autoblog. Weblogs, Inc. Retrieved 2008-03-19. ^ Siler, Wes (2008-03-19). "2009 Honda Fit Is Go, Again". Jalopnik. Gawker Media. Retrieved 2008-03-19. ^ Bell, Damon. "The Consumer Guide to 2009 Subcompact Cars". Consumer Guide Automotive. HowStuffWorks. Archived from the original on 2009-08-30. Retrieved 2009-08-25. The most expensive subcompact, the top-trim-level Honda Fit with an optional navigation system, has a still-modest base price of $18,760. ^ "Honda Fit production could shift to Ohio". The Columbus Dispatch. Archived from the original on 2013-01-21. Retrieved 2009-10-22. ^ "2011 Honda Fit Receives More Standard Features; VSA Added to All Models". theautochannel.com. ^ "2009 Honda Fit Review". JB car pages. Retrieved 2009-03-09. ^ "2012 Honda Fit Receives Updates and More Features" (Press release). American Honda Motor Co. Aug 16, 2011. ^ Josh Jacquot (Sep 5, 2011). "Honda: What's New for 2012". InsideLine. ^ Honda Canada Inc. "2015 Honda Fit". honda.ca. ^ Mike Ramsey (Aug 13, 2011). "Honda Plans Mexico Plant". The Wall Street Journal. ^ khong, ys (2008-08-20). "Honda Malaysia Launches All-New Jazz". Autoworld.com.my. Retrieved 2019-03-05. ^ TheGunner (2009-06-02). "Honda Jazz Grade S Modulo Limited Edition". Autoworld.com.my. Retrieved 2019-03-05. ^ Kon (2011-04-27). "Honda Malaysia introduces updated Jazz". Autoworld.com.my. Retrieved 2019-03-05. ^ Kon (2012-08-08). "Honda Jazz 1.5S at RM99,800". Autoworld.com.my. Retrieved 2019-03-05. ^ Kon (2013-07-11). "Honda Jazz Petrol now assembled locally". Autoworld.com.my. Retrieved 2019-03-05. ^ N. Madhavan (2011-10-02). "Lively new hope". Business Today (India). ^ "Press Releases". Honda Car India. 2009-06-10. Retrieved 2010-10-07. ^ "Honda Cars India postpones Next-Gen Jazz launch to next year". CarTrade. Retrieved 17 December 2014. ^ "Honda Australia confirms 2011 Jazz and City will receive stability control". Themotorreport. ^ a b "Honda Jazz Vibe Arrives From Japan To Fill Australian Supply". Themotorreport. Jan 11, 2012. ^ Tim Beissmann (March 1, 2012). "Honda Australia draws 'line in the sand' in 2012". Car Advice. ^ "The Official Honda Jazz Website (UK)". Archived from the original on 2008-08-05. Retrieved 2008-07-28. ^ "UK Honda Jazz production begins – Autocar.co.uk". Retrieved 2009-10-10. ^ "Honda Jazz hybrid from 16k". Autoexpress. Retrieved 2009-12-11. ^ "NHTSA Rankings for 2009 Honda Fit". National Highway Traffic Safety Administration. Retrieved 2008-12-28. ^ "2015 US-spec Honda Fit launched in Detroit". worldcarfans. Retrieved 2014-04-16. ^ a b "New Honda Fit introduced with "Earth Dreams" engine, CVT, new body construction". sae.org. ^ "Honda Fit specs in Japan". Retrieved 2014-04-16. ^ "Honda Worldwide - September 5, 2013 "Honda to Release all-New Fit and Fit Hybrid in Japan"". honda.com. Archived from the original on December 2, 2013. ^ http://www.extremetech.com/extreme/174741-2015-honda-fit-brings-more-tech-to-the-subcompact-market-navigation-for-60-anyone The 2015 Fit was manufactured in Honda's new Mexico plant. Due to growing pains, the 2015 Fit (and HR-V also assembled at the plant) suffered high rates of assembly error. Honda responded to poor quality control by selling 2017 Fits in the U.S. that came from a plant in Japan. The HR-V continues to be assembled in Mexico. ^ "2014 Honda Jazz launched in Malaysia - RM73k-RM88k". paultan.org. 16 July 2014. ^ "2017 Honda Jazz facelift launched in Malaysia - 1.5L and Sport Hybrid i-DCD variants, from RM74,800". Paul Tan's Automotive News. 2017-06-06. Retrieved 2018-02-25. ^ Inc., American Honda Motor Co.,. "Refreshed 2018 Honda Fit Launches Next Month with More Aggressive Styling, New Sport Trim and Available Honda Sensing®". www.prnewswire.com. ^ "Honda Fit Ranked Best-selling Vehicle in 2002 in Japan". Honda. 2003-01-09. Archived from the original on 2016-03-02. Retrieved 2010-01-20. ^ a b c d e "Cumulative Sales of Honda Fit Reach 1.5 Million Units in Japan, 3.5 Million Units Worldwide". Honda Motor (Press release). 2010-10-06. Archived from the original on 2010-10-17. ^ "Orders Received for Newly Introduced Fit". Honda. 2004-06-25. Archived from the original on 2009-09-12. Retrieved 2010-01-20. ^ Nunez, Alex (2007-07-18). "Honda: 2,000,000 Fits sold worldwide". Autoblog. Retrieved 2007-07-18. ^ Abuelsamid, Sam (2008-06-23). "Honda boosting Fit production to meet U.S. demand". Autoblog. Retrieved 2010-03-20. ^ a b "American Honda December Sales". Hondanews.com. Archived from the original on 2010-02-12. Retrieved 2010-10-07. ^ "American Honda December 2010 Sales". Hondanews.com. 2011-01-04. Archived from the original on 2011-11-11. Retrieved 2013-01-31. ^ a b "American Honda December 2012 Sales". Hondanews.com. 2011-01-03. Archived from the original on 2013-01-12. Retrieved 2013-01-31. ^ "Honda Division Breaks Annual Auto Sales Record as Honda and Acura Brands Set Numerous New Sales Marks". Honda Newsroom. ^ Inc., American Honda Motor Co.,. "American Honda Sets New All-Time Annual Sales Record". www.prnewswire.com. ^ "American Honda Sets All-Time Sales Records Powered by Demand for Cars and Trucks". hondanews.com. ^ "Honda Jazz Cars Ever So Nice". The Inspiration Room. 2006. Retrieved 2008-12-28. ^ "Honda Fit Is Go with Animation". The Inspiration Room. 2006. Retrieved 2008-12-28. ^ Rubin Postaer and Associates/Digital Domain (for Honda) (2008-10-16). "Honda Fit Commercial: "Mecha Mosquitoes"". YouTube. Retrieved 2008-12-28. ^ Rubin Postaer and Associates/Digital Domain (for Honda) (2008-10-16). "Honda Fit Commercial: "Defense Mechanism"". YouTube. Retrieved 2008-12-28. ^ Rubin Postaer and Associates/Digital Domain (for Honda) (2008-10-16). "Honda Fit Commercial: "Bats"". YouTube. Archived from the original on May 17, 2015. Retrieved 2008-12-28. ^ "Ad Campaign for the All-New Honda Fit Flaunts Fierce, City-Smart Style: Honda's Integrated National Ad Campaign Includes TV, Print, Interactive and Outdoor". rpa.com. 2008. Archived from the original on 2009-01-09. Retrieved 2008-12-28. ^ "Honda Fit Animation Again". 2008. Retrieved 2008-12-28. ^ a b Garrett, Jerry (2010-11-17). "Honda Fit EV: An All-Electric Concept". New York Times. Retrieved 2010-11-18. ^ a b c d "First Look: Honda Fit EV Concept". Motor Trend. 2010-11-17. Retrieved 2010-11-21. ^ Carpenter, Susan (Nov 17, 2010). "L.A. Auto Show: Honda unveils Fit EV, available in 2012". The Los Angeles Times. ^ "Honda announces second plug-in vehicle testing program; Japan joins US, China may follow". Green Car Congress. Dec 20, 2010. ^ "Honda to Start Electric Vehicle Testing Program with Saitama Prefecture -Honda's Next-Generation Personal Mobility Test Vehicles and Charging Facilities Make Public Debut" (Press release). Honda. Dec 20, 2010. ^ Yoshio Takahashi (Dec 21, 2010). "Honda Eyes China's Electric Car Market". The Wall Street Journal. ^ "Honda Starts Electric Vehicle Testing Program with Kumamoto Prefecture" (Press release). Honda. Dec 24, 2010. Archived from the original on 2012-06-15. ^ "Honda begins demonstration testing of Fit EV concepts in Guangzhou; targeting EV production in China before end of 2012". Green Car Congress. 2011-11-08. Retrieved 2011-11-08. ^ Josie Garthwaite (2010-11-21). "Google's GFleet To Provide Testing Ground for Electric Cars". earth2tech. Retrieved 2011-11-09. ^ Honda (2011-09-20). "Honda releases more details on Fit electric concept". AutoblogGreen. Retrieved 2011-11-09. See the Press Release for details about the Advanced Technology Demonstration Program in the USA. ^ Liane Yvkoff (Feb 8, 2012). "Google and Stanford early adopters of Honda Fit EV". Cnet.com. ^ a b c "Honda begins deliveries of 2013 Fit EV; first unit to City of Torrance". Green Car Congress. 2012-01-21. Retrieved 2012-01-22. ^ Danny King (2012-02-13). "Honda sends more Fit EVs to Google, Stanford University for testing". Autoblog Green. Retrieved 2012-03-17. See details in Honda Press Release. ^ "Honda will debut production Fit EV, 4th generation CR-V at LA Auto Show". Green Car Congress. 2011-10-25. Retrieved 2011-10-26. ^ a b c d Tori Tellem (2011-11-16). "In Search of the Perfect Fit, Honda Goes Electric". The New York Times. Retrieved 2011-11-18. ^ Ingram, Antony. "2014 Honda Fit EV: Model Year Ends Early As Last Cars Are Built". GreenCarReports. Retrieved 15 July 2014. ^ "Honda Fit EV Pricing". NADAguides.com. ^ a b "Honda cuts US lease price for Fit EV to $259/mo". GreenCarCongress. Retrieved 15 July 2014. ^ Philippe Crowe (2013-02-13). "Fit EV Heading East". HybridCars.com. Retrieved 2013-02-13. ^ Frank Markus (Dec 5, 2011). "First Drive: 2013 Honda Fit EV". Motor Trend. ^ a b "2013 Honda Fit EV". Fueleconomy.gov. Retrieved 12 March 2017. ^ Sebastian Blanco (2012-06-06). "Honda Fit EV rated at 118 MPGe with 82-mile range by EPA *UPDATE". Autoblog Green. Retrieved 2012-12-15. ^ Brad Berman (2012-06-06). "Honda Fit EV Beats Competitors on MPGe and Range". PluginCars.com. Retrieved 2012-06-06. ^ Brad Berman (2012-12-07). "2013 DOE-EPA Fuel Economy Guide Includes 14 Plug-in Models". PluginCars.com. Retrieved 2012-12-15. ^ US DoE and US EPA. "Most Efficient EPA Certified Vehicles". Fueleconomy.gov. Retrieved 2012-12-15. ^ Honda Media Room (2012-06-06). "2013 Honda Fit EV receives EPA fuel economy rating of 118 MPGe; highest yet". Green Car Congress. Retrieved 2012-06-06. ^ "Toshiba's SCiB battery for the Fit EV". Green Car Congress. Nov 17, 2011. ^ Addison, John (2010-11-30). "New Honda Fit EV likely to cost less than Nissan LEAF". CleantechBlog. Retrieved 2011-11-30. ^ Cole, Jay (2014-01-03). "December 2013 Plug-In Electric Vehicle Sales Report Card". InsideEvs.com. Retrieved 2014-01-03. ^ Jeff Cobb (2015-01-06). "December 2014 Dashboard". HybridCars.com and Baum & Associates. Retrieved 2015-06-20. ^ Jeff Cobb (2015-05-02). "April 2015 Dashboard". HybridCars.com and Baum & Associates. Retrieved 2015-06-20. Only 1 Honda Fit EV was leased during the first four months of 2015. ^ Sebastian Blanco (2015-03-23). "Honda Fit EV lease drops to $199 a month, but there's a catch". Autoblog.com. Retrieved 2015-06-20. ^ "Japan Car of the Year" (PDF). 2009-10-21. Archived from the original (PDF) on 2010-07-10. Retrieved 2010-01-20. ^ "Greenest Vehicles awards". Greenercars.org. Archived from the original on 2007-09-10. Retrieved 2010-10-07. ^ "MotorWeek Best Small Car". Mpt.org. Archived from the original on 2011-01-20. Retrieved 2010-10-07. ^ "MotorWeek Best of the Year". Mpt.org. Archived from the original on 2011-01-20. Retrieved 2010-10-07. ^ Hardigree, Matt (2007-12-17). "U.S. News & World Report Names Best Cars for 2008". Jalopnik. Gawker Media. Retrieved 2007-12-17. ^ "Top 10s and More | More Top 10s". Cars.com. Retrieved 2010-10-07. ^ "2009 Motor Trend Car of the Year: The Contenders are revealed, what's your pick?". Motor Trend Blog. Motor Trend. 2008-09-25. Retrieved 2008-10-01. ^ Frank Filipponio (Feb 23, 2010). "Despite recalls, Consumer Reports names Honda Fit, Toyota Prius Best Values". Autoblog. ^ Deaton, Jamie Page (2009-12-11). "Best Cars for the Money 2010". U.S. News Rankings and Reviews. U.S. News & World Report. Archived from the original on March 12, 2009. Retrieved 2009-12-11. ^ James Healey (Feb 28, 2011). "Consumer Reports lauds Honda Fit for value, rips Jeep Wrangler". USA Today. ^ "Honda Fit tops list of best value cars". The Boston Globe. Mar 25, 2012. Archived from the original on July 9, 2012. ^ "2012 Best Cars for Families Awards". U.S. News Rankings and Reviews. Retrieved 2012-04-01. Look up fit in Wiktionary, the free dictionary. Wikimedia Commons has media related to Honda Fit, Honda Jazz and Honda Fit EV.